So, for those of you who have been keeping up with this comic regularly, you may have noticed that in the past few months things have fallen a bit behind. Well, if you don’t keep up with my regular blog (on jmdesantis.com), then I suppose a bit of an explanation is needed. First and foremost, between the Rosarium Publishing IndieGoGo campaign and the end of my third year of teaching (spanning the months of April through June of this year) things became a bit hectic. I began falling behind on just about everything, including this little, three-panel comic which I do enjoy doing so much. (I did my best to poke fun at that with #44.) After all, it helps me keep my sanity in the midst of the much greater and more labour intensive work I do on my Chadhiyana comic series, plus it gives me an outlet for regularly putting out work while I complete other projects which are in various stages of development. In July I had caught up and was nearing the first anniversary of Gentleman Cthulhu (which I had officially launched on August 20, 2015–H. P. Lovecraft’s 125th birthday). Then something quite unfortunate and unexpected happened. Following Boston Comic Con and a short vacation in Salem, my girlfriend and I had to rush back to see to our cat, Mishu, who had been sick and ultimately wound up dying shortly after our return. (I wrote extensively about this in a blog piece on jmdesantis.com last week.) With that, and even being so near the end, I fell behind again. Adding to this, the three months where things became disorganised (sometimes I was posting two comics a week, sometimes none), I lost count of exactly which numbered comic would denote one year of Gentleman Cthulhu. After all, the “holiday cards” for New Years and the Holiday Season weren’t numbered, and I knew there was at least one comic labeled “Special” (as in being outside the regular numbering system). I know, I rather complicate things overmuch sometimes. Anyway, it turns out there were two Special comics, and the two Holiday cards meaning that 52 comics (the number of weeks in the year) was reduced to 48 (as far as the numbering system is concerned). So, number 48 is, in fact, supposed to be the final comic of the first year of Gentleman Cthulhu comics. Hence the comic seen here, three weeks behind when it should have been posted. That said, I do have one other completed comic, two in progress comics, yet one more planned specifically for next week (as it’ll be the week I go back to my teaching post) and yet another I am trying to develop in honour of the passing of Gene Wilder (I know there have been a lot of dedication comics in this first year, but it can’t be helped as Young Frankenstein is both my favourite Gene Wilder film and my favourite Mel Brooks film and a fitting addition to this comic). That all said, I’m hoping to post another two comics this week (if I can get the Young Frankenstein one complete) and perhaps two next week (as, if everything ran smoothly, next week’s comic would have been #52). Then I am hoping no further delays will ensue, and (as I had stated at the end of July on my blog) going forward I will do what I can to ensure there are no further delays. 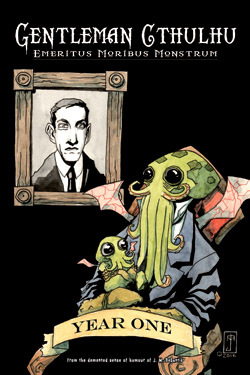 If it’s any consolation to my Gentleman Cthulhu fanbase, it has been my plan all along to offer at least the first year of Gentleman Cthulhu comics in print (hence my particular fixation with having the proper number of comics prepared and published). Just yesterday, I finished the cover illustration for that collection and am working toward having the book ready for purchase in the coming months (it was one of my plans for this summer, but again, there were unforeseen delays). So keep checking back weekly for more comics, and this week, check back a few times. Hopefully I’ll have this all sorted out properly soon enough.